What would the UK parliament look like under Holyrood rules? I am avidly following the election campaign currently underway in Britain. My last posts on this blog were at the time of the Scottish referendum last year, and it has been fascinating to watch the consequences of that vote play out over the subsequent months. Now the prospect of a second consecutive coalition government in Britain has me thinking about the structure of parliamentary democracy and whether coalitions are adequate representations of the popular vote. One major question about the current “first past the post” system is whether it yields a result that is consistent with the popular vote. This is especially important when considering future coalition negotiations. Right now, it appears that the Scottish Nationalist Party will control 8.5% of Parliamentary seats with just 4.5% of the vote. Conversely, the UK Independence Party will control only .03% of Parliamentary seats despite currently polling at 13.6% popular support. Obviously this has implications for the composition and perceived legitimacy of whatever coalition comes into power on May 8th. Since the SNP is poised to play such a large role in the British Parliament, it is interesting to imagine what it would look like if the British Parliament at Westminster were elected under the same rules as the Scottish Parliament at Holyrood. Under Holyrood rules, the membership of the Scottish Parliament is split evenly between representatives of constituencies and representatives of party slates elected from Scotland’s regions. The Holyrood rules were set up so that no one party would be able to dominate Scotland, and to facilitate stable parliamentary coalitions. The late weeks of the Scottish independence campaign have featured threats and warnings against Scotland that its economy will be in dire trouble if it secedes from the UK. One of the assumptions behind these threats and warnings is that Scotland will be entirely at the mercy of the British parliament and major corporations. It won’t be. In fact, Scotland has valuable things that the UK wants, which Scotland can trade for the things that it wants but can’t achieve through independence alone. – Access to the pound sterling, preferably through a cooperative agreement with the Bank of England so that Scottish banks are backed by a lender of last resort. – Admittance to NATO and the EU as a full member state of both organizations. – A proportionate share of UK national assets. – An open border with the UK, to facilitate trade. – For Scotland to assume its share of the UK national debt. – For Scotland to continue to host the Royal Navy’s nuclear submarines, which are armed with Trident nuclear missiles. 1) NATO/EU membership and the national debt are inextricably linked. If Scotland is a successor state to the UK, then it should automatically qualify for membership while also automatically owing a share of the debt. But if Scotland is not considered a successor state, but instead a breakaway state, then its membership in international organizations cannot be assumed, nor can its responsibility for the UK’s national debt. Logically, the two are connected, and having one without the other does not make sense. 2) The question of Scotland’s share of UK national assets is a tricky one, and again it comes down to whether or not Scotland is a successor state or a breakaway state. If a successor, then national assets need to be divided proportionally, but if breakaway then Scotland might get nothing. If national debts are shared, then so should national assets. Again, this is really an extension of point 1. 3) Keeping the pound sterling might keep banking offices open on Edinburgh, but it won’t be good for the country as a whole to not control its own currency. Best option here is to stay on the UK pound for an interim period, then convert on a 1:1 basis to Scottish pounds, the value of which could then be set by a new Scottish central bank. It is also reasonable, should Scotland and the UK agree that Scotland is a successor state picking up its share of the debt, that Scotland should enjoy access to the currency the debt is denoted in, for at least an interim period. 4) The Trident submarines are a trump card for Scotland. The SNP doesn’t want them and the draft constitution calls for their removal, but an interim agreement on allowing them to be based in Scotland for a ten- or twenty-year period, while the UK makes other basing arrangements, could be traded for considerations on the border and any number of other issues. So, enough with the threats and warnings. Scotland has plenty to trade, and both sides should be able to reach an agreement in the event that Scotland chooses independence. I was very happy that The Atlantic‘s James Fallows reprinted a letter of mine concerning the swiftly approaching vote on Scottish independence. You can read my take on the issue at The Atlantic here and the responses to it here. Last night I finished reading Dudley Taylor Cornish’s The Sable Arm: Black Troops in the Union Army, 1861-1865, a history of the United States Colored Troops (USCT), and it has dramatically changed my view on how to teach the American Civil War. Often for simplicity’s sake, the Civil War is taught as a North-versus-South conflict, as slave state-versus-free state, or as a “war between the states”. The Civil War had elements of all of these things, but what the book really brought out for me was the extent to which the American Civil War was a civil war within the states as well as between them. Estimates of the exact composition of the USCT vary, but at least two-thirds of its members were directly recruited in the South, and the early regiments bore state names, such as the “1st South Carolina Volunteers”, before they were converted to federal designations. Of the 180,000 soldiers who served in the USCT at least 120,000 were from the Confederate states. Tens of thousands of other Southern black men served as laborers for the Union Army (although not in uniform as soldiers). All told, a significant portion of the Southern black male population of military age played a direct or indirect role in support of the Union war effort. This reminds me that many southern whites fought for the Union as well. Kentucky, as well as Missouri and Maryland, stayed in the Union despite being southern, slave-holding states. A substantial minority within each Unionist Southern state still formed regiments for service in the Confederate army, but the majority was Unionist, and neighbors fought guerrilla wars against each other. The western half of Virginia had a white Unionist majority, and broke off to become the new state of West Virginia. There was strong white Unionist sentiment in East Tennessee as well, but the Unionist militia there was overwhelmed in the early months of the war. So what we have is substantial white Unionist sentiment in the Upper South, and substantial black Unionist sentiment throughout the South, but particularly in the Lower South where the majority of the slave population was. I don’t have firm numbers on this, and would be interested if someone does, but my guess is that if the South’s four million slaves are added to the white Unionist populations of Missouri, Kentucky, Maryland, western Virginia, and eastern Tennessee, then as much as a third to half of the Southern population supported the Union. This is obviously a very different picture than the one in which two distinct regions fought one another, or even in which two distinct blocs of Union and Confederate states fought each other. It indicates that the war within the South was just as important as the war between the regions or between the Union and Confederate governments. The “house divided” was not simply the United States, it was also Southern society itself. Lessons teaching the history of the Civil War should emphasize this important aspect of the war. What’s the Point of the Declaration of Independence? Happy July 4th, everyone. There was a little item in the New York Times yesterday, about whether or not a mark in the Declaration of Independence is a period or an ink smudge, and what that means. Why is this important? In the grand scheme, it isn’t. But it lends some interesting insight into whether or not the Continental Congress thought that the state is a necessary component of liberty. At question is whether the list of natural rights – “life, liberty, and the pursuit of happiness” – is part of the same sentence as what followed: “That to secure these rights, Governments are instituted among Men, deriving their just powers from the consent of the governed.” Whether or not this is a period or an ink dot (or a comma, the article doesn’t go into that) doesn’t substantially change what Congress was trying to say, but it does indicate how close they thought the relationship was between the two concepts. One interpretation, which is most strongly held by libertarians, is that the state is something foreign and extrinsic to liberty – that it is a necessary evil, so to speak. But there is another interpretation, which is that the state is a necessary good, and that liberty really can’t be enjoyed without it. Generally speaking, it is the second interpretation that I think is closer to the Lockean philosophy held by most of the delegates to the Continental Congress. According to Locke, the commonwealth emerging from the social contract was an organic part of society, not something that existed in opposition to it. Locke could hold this view because the state in 17th century England was just as Locke described it: it was small, it was local, and it was limited by traditions emerging organically from English society, particularly feudal relationships, the Magna Carta, and the common law. The large Anglo-British state that fought France and later alienated its American colonies didn’t exist until after the Glorious Revolution – a good ten years after Locke composed his Second Treatise on Government. Locke provided fertile ideas to the colonists because they continued to exist in this smaller, pre-Glorious Revolution state. Some good research has been done on the extent to which colonists were still utilizing 17th century political ideas as late as the 1770s (see the work of JGA Pocock, John Phillip Reid, and Eric Nelson). Meanwhile, the governments of the American colonies remained small, local, and limited by legal traditions. This was why they so strenuously objected to the imposition of the British imperial state after 1763. The issue of the period separating natural rights from the role of government in the Declaration of Independence is a useful reminder that the American Revolution could be a “revolution in favor of government” while at the same time being a rebellion against a large external state. It indicates that what the Continental Congress really cared about was not rebelling against the government, but establishing government that was rooted in the needs of the community and under the control of its subjects. It’s been a while since my last post on this blog, but I’ve been busy with some other projects that should see the light of day over the course of 2014. One thing that I can reveal is my latest contribution to the IHR’s Reviews in History, a review of the notable Jack P. Greene’s latest book, Evaluating Empire and Confronting Colonialism in Eighteenth Century Britain. I’m a big fan of Greene’s work, although I didn’t feel that this one rose to the same level as some of his other writings. I will give Greene credit for attempting to analyze political language on the important question of how Britain came to embrace its empire. After all, the British Empire was originally just a collection of trading outposts, and global dominance was hardly something that this famously insular people had sought out. But doing history of language is tricky, because of the extraordinary temptation to substitute one’s own categories of language for ones that were actually in use at the time. I think that is what happened here. Reference management software is a program that offers some combination of note taking and bibliography building. 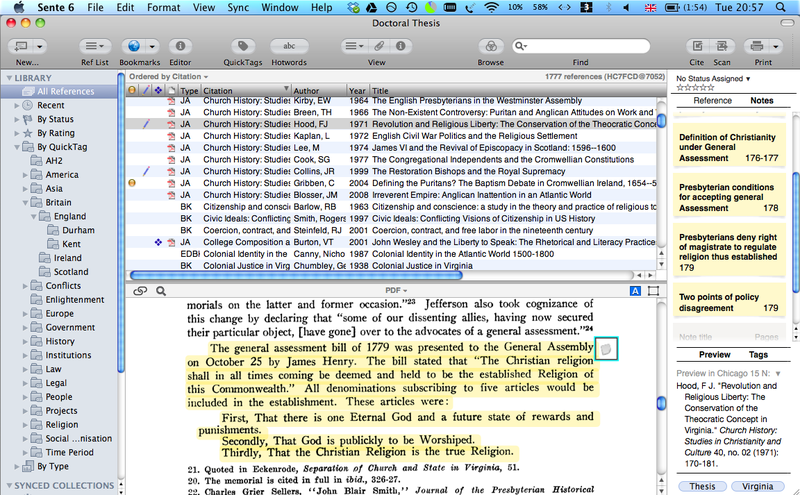 For Mac, I use Third Street Software’s Sente. For PC as well as Mac, there are many options that I am less familiar with, ranging from paid programs Endnote to open-source freeware such as Zotero. I will offer a detailed review of Sente before summarising some other offerings for Mac and Windows. While I do not feel as strongly about it as I do Scrivener, on the whole I have been very pleased with Sente, which I have been using since the first month of my PhD. Since that time, my library has grown to nearly 1,800 references. The Sente developers have been particularly good at expanding Sente’s capabilities, notably in the area of tagging. On the whole, computer organisation is moving away from the old file folder, in which files were grouped together into hierarchical folders. The disadvantages of this approach are that a file can only be in one folder at a time, and only one folder at a time can be viewed. Like the single-page view within a traditional word processor, this approach is unsuitable for large projects and big data. A different approach is needed. Tagging provides a much more flexible way of organising data. Suppose I take Gordon Wood’s Radicalism of the American Revolution. Under a folder system, I would have to choose a single folder to place it in, and later on I might forget which folder that is; but with tagging, I can assign multiple search terms to a citation while leaving it in the main database. For Wood’s book, I would want to tag the citation with ‘American Revolution’, but I might also want to tag it with ‘social reform’ or even ‘Matt Damon’. Then, when I am researching a particular topic, I can simply enter a keyword and Radicalism will be displayed along with other relevant sources. This is a much better way of organising a large database and can help to simulate the useful sense of browsing a bookshelf, whereby the researcher can often discover a source they might otherwise have overlooked in a more rigid setting. A nice thing about Sente is that it is free, but a downside is that they have linked the ability to create a bibliography of more than 100 sources to the purchase of online sync space. The sync space is nice, especially if you are running Sente for iPad, but I have not found it to be essential since I am only using my main computer, so I wish they hadn’t done that, but at least it means the program is free to start. Buying a Sente license unlocks the limit and buys you 1 GB of permanent sync space; more space requires a yearly subscription. My own library is about 2.2 GB, but at 1,777 citations my library is probably bigger than most PhD candidates’, since I have included a fair number of ebooks and long law journal articles that tend to be 2-3 times the size of a humanities article. A single gigabyte of space should be sufficient for a library of about 1,000 sources, a divided roughly equally between journal articles with the PDF attachments, and books that are the citation only. Another nice thing is that all your attachments can be annotated within the Sente viewer. Thus I am able to keep all of my notes directly attached to their source material and viewable on demand. Now, it is possible that Sente is not for you, either because it seems too complicated (although its complexity is an indication of its power as a tool) or because you don’t run a Mac. I will run through a few more options. Endnote seems to be the most widely used reference manager for Windows and Mac, but it’s expensive. I would say that it is the closest to Sente you can get for Windows, being a proper database program, but it doesn’t seem to have Sente’s advanced functionality involving tagging. On the one hand, it is widely used, but on the other why pay up front when you don’t have to? There are lots of other options out there. One such program that comes recommended to me by a colleague is Zotero, a browser-integrated reference manager that allows you to harvest data directly from webpages. The advantage of Zotero is that it is a much lighter piece of software than Sente or Endnote. Zotero is functional enough that Endote’s creators sued Zotero for infringing upon Endnote, a suit that was dismissed. Given also that Endnote costs $139 for the student edition, it seems that Zotero is worth trying out first. I don’t think there is a single right answer to the question of which reference manager to use, and fortunately there are a large number of programs to choose from. It’s about choosing the reference manager that you feel most comfortable using, balanced with the ability to expand in functionality as your research progresses. That second part is crucial and easy to overlook at the beginning of a project. Once you build a library within a reference manager you won’t have the time or energy to build a new one in a different program, so make sure that you balance the two above factors; citations can be ported over but not necessarily the metadata that makes a collection of citations into your personal library. Simplicity of use may indicate a lack of functionality. This is not always the case, but be careful, read reviews, and make an informed decision. Movie Review: Was Robin Williams the Villain of Dead Poets Society?